A battery-operated wireless DMX uplight with 8+ hours of battery life that is totally unique from all other decoration lighting. Discover a completely new style of lighting and create your own light designs – for an affordable price! Magnetically mounted optics. 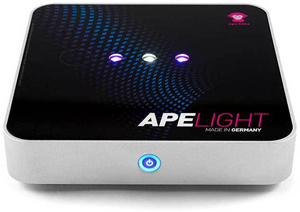 The APE LIGHT is a battery-powered multi pixel LED spotlight, able to display several colours at the same time and can easily be regulated via remote control or wireless DMX. Thanks to a magnet, the spherical optic, which is included in the scope of delivery, adheres to the surface and thereby creates thousands of different light paintings on your wall - exactly as you require. By adjusting the lense's position, you can set the beam angle and achieve the desired effect. You can illuminate walls and ceilings, modify the beam angle, decide whether you want to create homogenous light or effects. 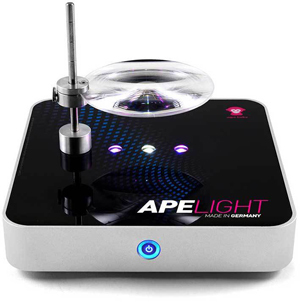 Or you simply use the APE LIGHT without optics and bathe your room completely in colour. 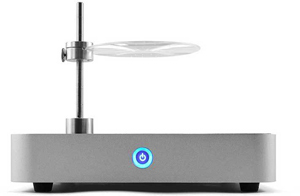 An integrated microphone matches automatically the surrounding sound level and adapts effects or colours to the beat. 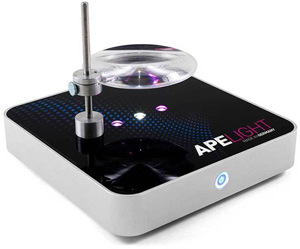 The APE LIGHT is operated through 20 customary built-in batteries which can be easily recharged using the provided power adapter. The remote control in credit card format has an integrated 2,4 GHz radio chip that enables you to monitor one or several APE LIGHTS from up to 50 meters distance. You can define 4 different groups. 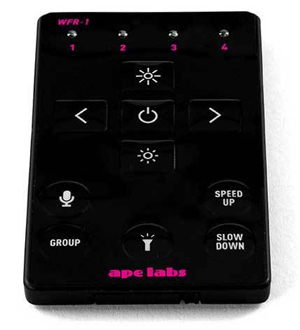 This allows you the operation of several APE LIGHTS in distinct colours or effects in different rooms. Of course, you can also run the APE LIGHT constantly on its power adapter. The built-in batteries will thus be carefully recharged and preserved.